The Batcave - it was the first area I designed and by far the one players will see the most in the game as it acts as a hub for Maxwell. The area had to be small but crammed full of things DC fans and casual comic fans alike would recognize. The biggest challenge, however, was which Batcave do we work from? There were many over the years - from 60's Adam West to the current Nolan films. We decided to go with a version similar to the 80's era Batman. The Giant Penny and Animatronic Tyrannosaurus were a must have. Jason Todd's memorial went in as well. The Bat Computer had to be a bright beacon as it would be the location of the in-game Bat Computer and we had to ensure that the lazy susan made it so we could store the Batmobile properly. 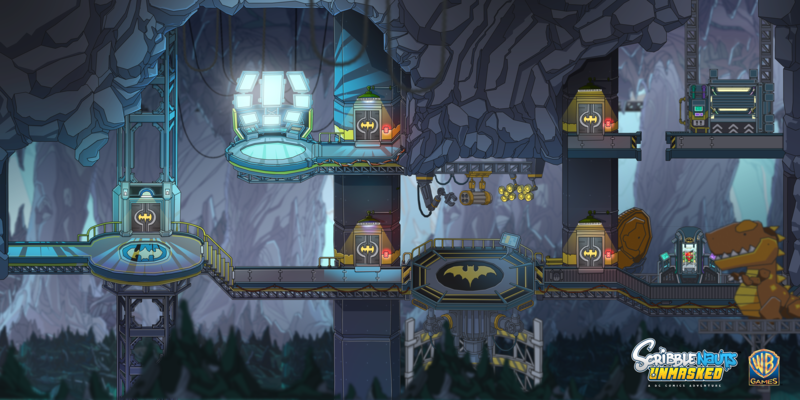 Depending on when the player visits the Batcave, certain Batman heroes will interact with one another or the player in various ways. The Batcave also doubles for a sandbox area for players to play freely in. The source of all of Batmans secrets, including files on the Justice League. A memorial to Jason Todd - who was killed by the Joker. Super heroes have to store their cars somewhere. More prominent in older comics, the Dinosaur and Penny are familiar decorations to any Batman fan.